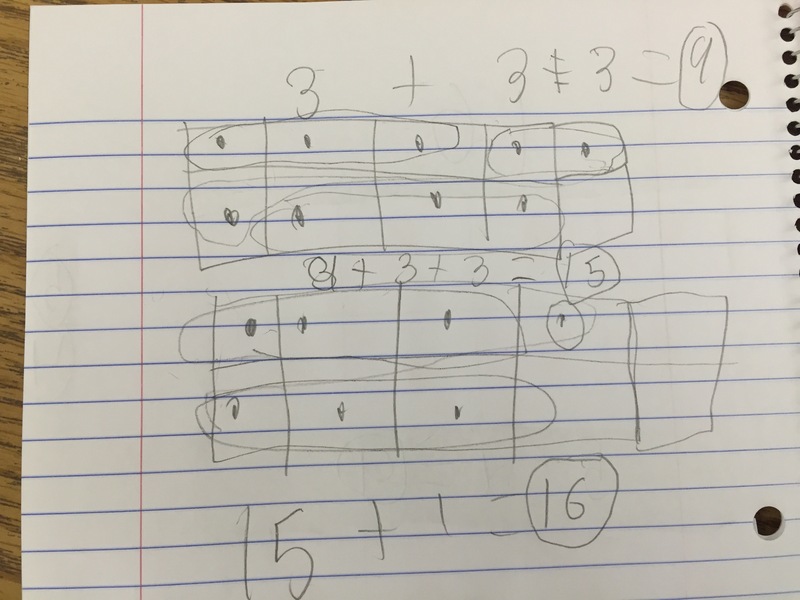 This string was to see some of the strategies they had used before and how they were thinking about organization, decomposition and notation. I included my reasoning for choosing each one under the image. I was curious to hear so many things in this first one. I wanted to see if the students saw the numbers in particular ways such as: 4 on top and 3 on bottom, subitize the die 4 to the left then the 3, or 6 and 1 more. After they saw them, how do they combine? Do they “just know” 4+3 or 6 +1, do they count up, do they count all? 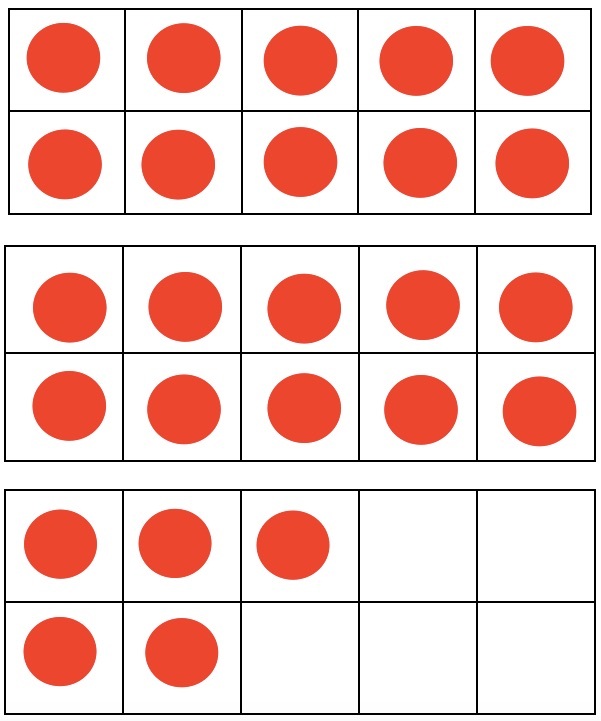 I was also curious to hear if any students reorganized the dots to fill the five on the top row to create 5 +2. And then do they combine them 5,6,7 or do they know 5 and 2 more is 7 right away? I was so impressed to hear the students do all of the things I anticipated very quickly and were very comfortable with writing equations, explaining the thinking, expressing where they made a mistake and talking to one another. Yeah K and 1 for building that community, it showed! On this one I was curious to hear all of the same things from the first one, but to also hear how they see/think about teen numbers. Do they move the dots to make the 10 and why do they do that? Do they know 8+4 and don’t think about moving the dots? How do they know it is 8 and 4…is it because of 5 and some more or because of the missing boxes to make the 10 or the 5? Again, all of the things I anticipated came out, however one little girl started explaining how she started by counting the empty boxes so I completely thought it was going to be 20 – 8 =12, however it did not go there. She did get to 8 empty boxes but then said, “so then I moved two up to make 10…” Ha, not where I saw that going! Building on what I learned from the first two, I wanted to see if and how they combined 10’s and then added on the extra dots. I didn’t make the 5 a neat row on the bottom because I wanted to see how they organized them. I was excited to see that as soon as I flashed the image the first time, all of their eyes went right to the bottom ten frame. That let me know that once they saw a full ten, they could just keep going and it would be easy to add that on at the end. 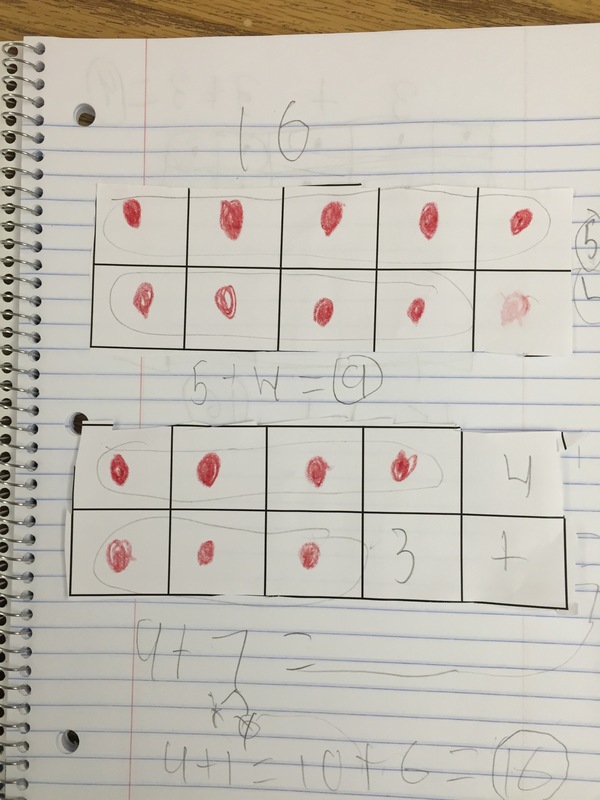 The students shared their thinking and then I wanted to focus on the 20 + 5 = 25 and 10 + 10 + 5 = 25. 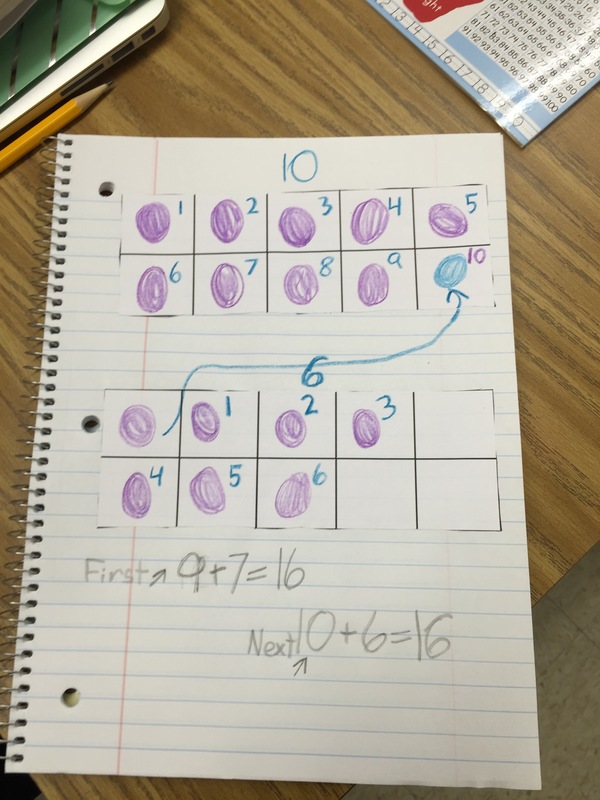 Having recently read/reread Connecting Arithmetic to Algebra and Thinking Mathematically, I am really interested in how students in the younger grades build this foundation for algebra. So I told them i was going to write an equation and I wanted them to tell me whether it was true or false and give me a thumbs up or thumbs down on it. I wrote 20 + 5 = 10 + 10 + 5. I was completely anticipating the majority to say false because they are used to seeing one number after the equal sign, so I was SO excited to see more than 75% of the class with their thumbs up. I asked them share why and many students said because the 10 and 10 are the same as the 20 on the other side and the five stayed the same on both sides. Others said because it is 25 on both sides so that is the same. This was such an interesting thing to think about for me…some student look for balance (equal on both sides) while others look to make them look the same on both sides (the 20 is the 10 + 10), a little bit different in my mind. 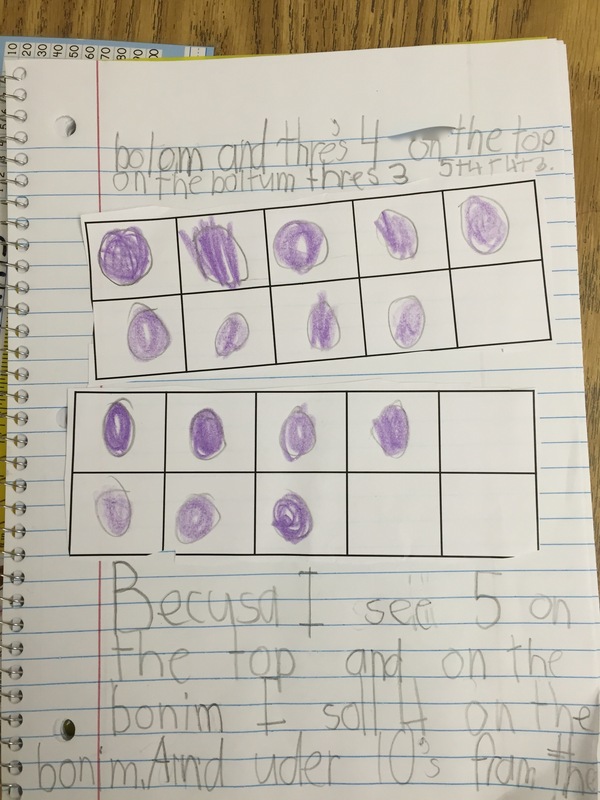 After the talk, I was SOOOO excited to see that Miss Robertson was starting math journals this year so we came up with a double ten frame (the first one with 9 dots and the second with 7 dots) for the students to explain how they think about the dots? What things to they look for or do to find the number? Here were some of their responses that I thought we so interesting and leaves me wanting to chat with them about their work!! I loved so many things about this one. The “10” in a different color makes me feel like that student thinks there is something really special about that 10. Although she numbered them by ones, I don’t think that is how she found the 16, but I would like to chat with her more. I wonder if she wrote 9+7 but then filled in the answer after she moved and solved the 10+6=16? This was so exciting because it was one of Miss Robertson’s ELL students and look at all of that writing!! While there is no answer, there is the expression, 5+4+4+3 at the top which shows me how he is seeing the dots. He went on explain about a 10, but I did not capture the back of the paper…grrrr… stupid me. I will have to go back to this one! But it was interesting the student in the first one wrote both! I am so excited for Miss Robertson to try a number string with them without the ten frames to see what they do with that! 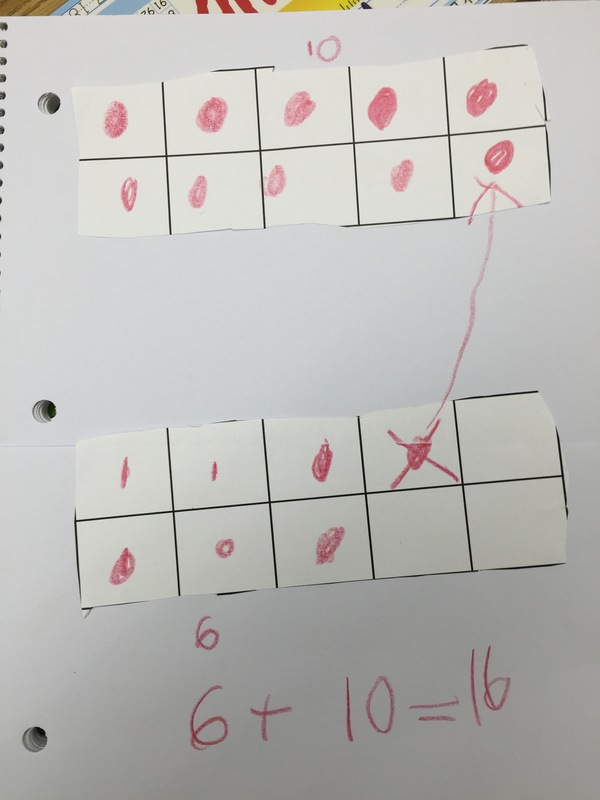 This student showed how they thought about the dots in each ten frame and then at the bottom shows beautifully how he combined 9+7. Under the 7 you can see the decomposition to 6 and 1, how lovely. The bottom thought string needs to be something to think about moving forward as teachers. Making explicit the meaning of the equal sign. Ok, I am obsessed with this one and I need to talk to this student one more time! I am so curious why this student chose 3’s. Did he see 3’s to start or did he know something about 9 being able to be broken into 3’s? I could completely see that if the top ten frame looked like 3’s or they were circled like the bottom one and the 3’s to the right were grouped together, however they are circled like he was counting off by 3’s by going down to the next row. Would he have done the same thing if the top ten frame was 8? In my head I am feeling like the student knew that 9 could be three 3’s, thirds, by the way it is circled. 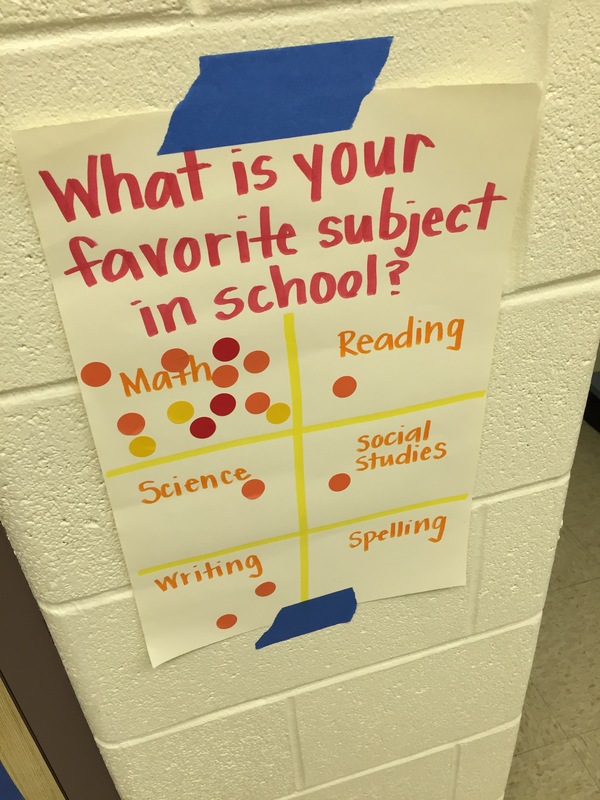 I don’t know if that is something students think about at all, so I am so curious. 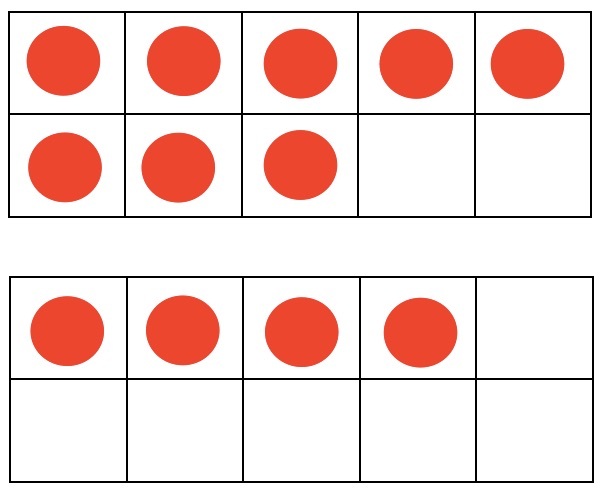 Or do students “see” threes but then circle them in a different way then they saw them? Now, onto my 1st and 5th grade experiences yesterday….I am not going to be able to keep up with these K-5 blogging ideas this year…so much great stuff! 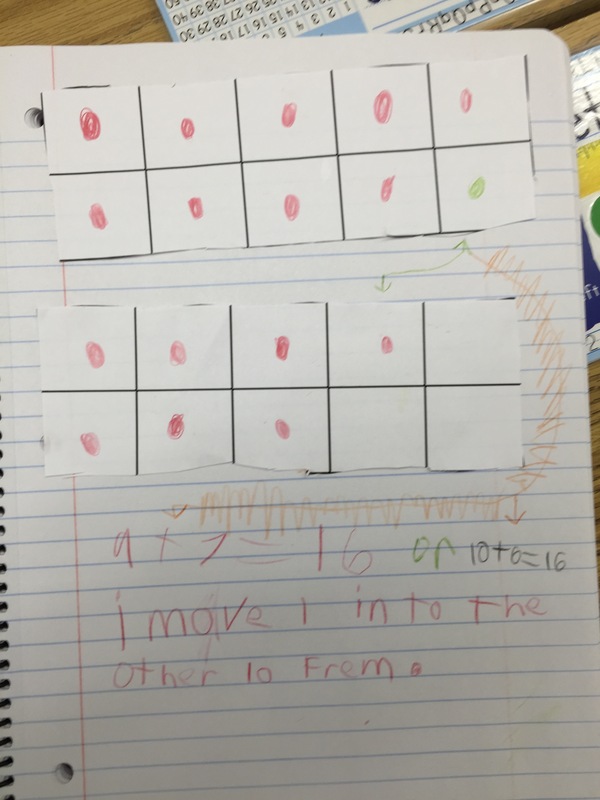 This entry was posted in 2nd grade, Number Talks and tagged 2nd Grade, number talk on September 10, 2015 by mathmindsblog.